Whoever thought of matching pork with squid in a same dish must be a brilliant cook. 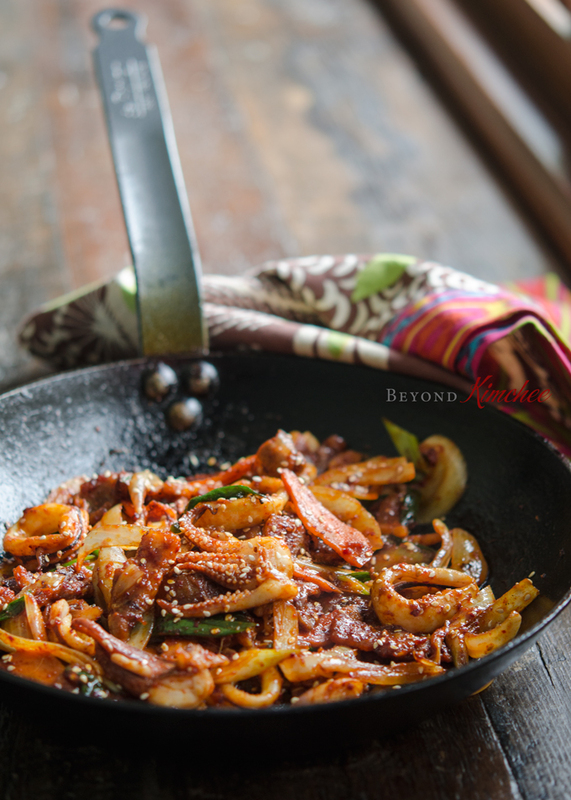 Here is one dish that you need to try if you like spicy Korean Pork or Stir-fried spicy squid. This is like a happily married couple of a 4 legged land animal and a 8 legged sea creature, who overcame all the obstacles from their background differences to bring their love into a victory. 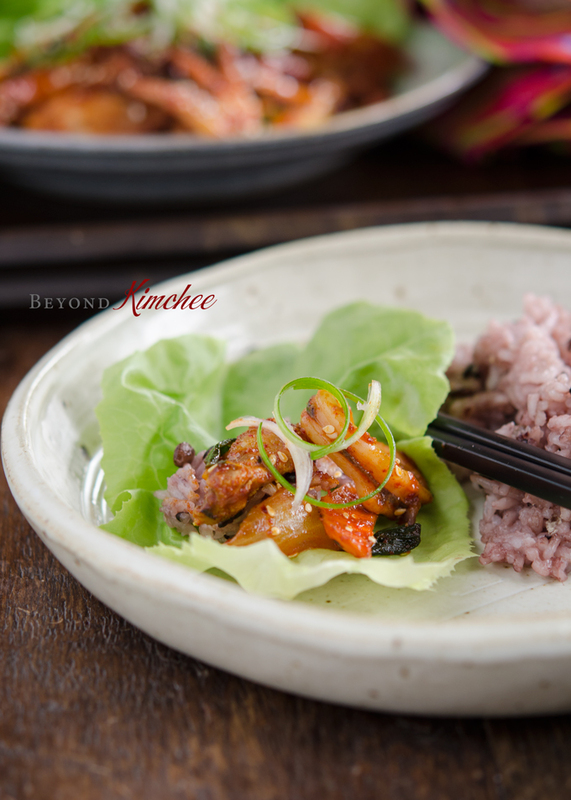 Oh-Sam Bulgogi (오삼 불고기) is the name of the dish. 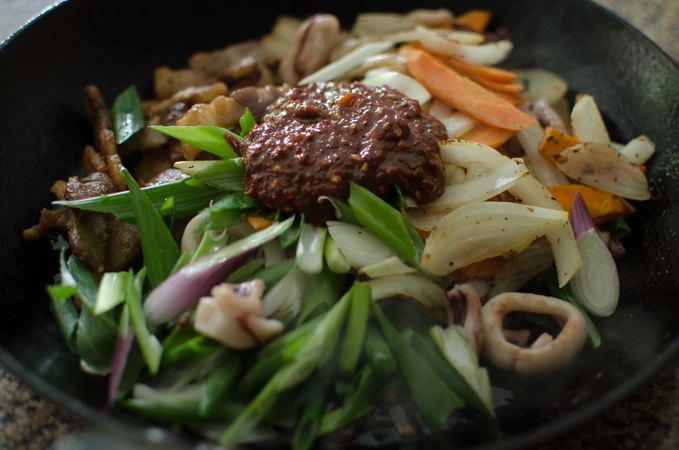 This spicy pork and squid stir-fry is quite a popular dish in recent years among many Koreans and I loved how lovely they go so well. There are different ways of making this lovely dish but the method I am sharing is one of my favorite. I got this idea from a Koran food TV show and adapted to bring the best result. 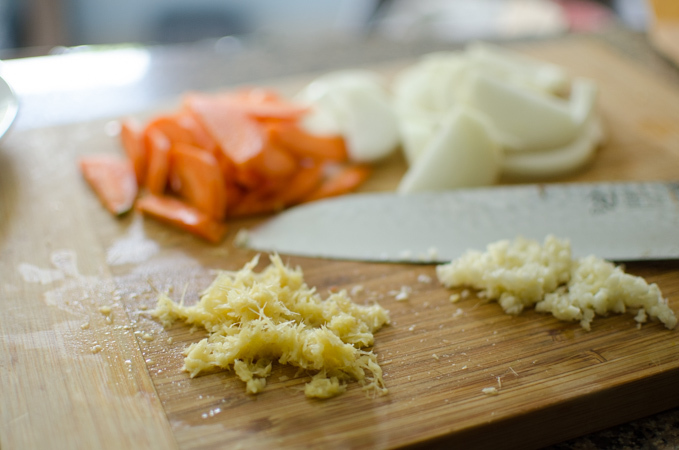 Slice the onion and carrot, and mice garlic and ginger. In a small mixing bowl, combine all the seasoning paste ingredients. The addition of curry powder is the key factor in this recipe, so please don’t skip it. I use pork belly because it becomes very crisp like bacon in this dish. If you don’t like the fattiness of pork belly, use pork shoulder instead. Dice the pork into bite size pieces and brown until fully cooked. 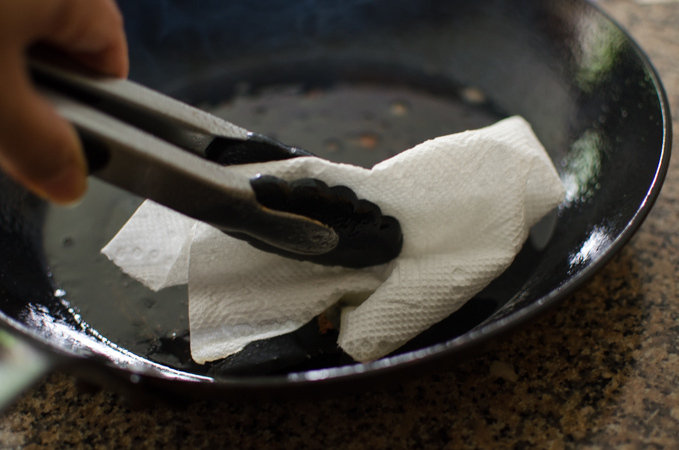 If there is too much pork fat remained in the skillet, wipe out with the paper towel. Add the squid pieces and cook until they are about done. 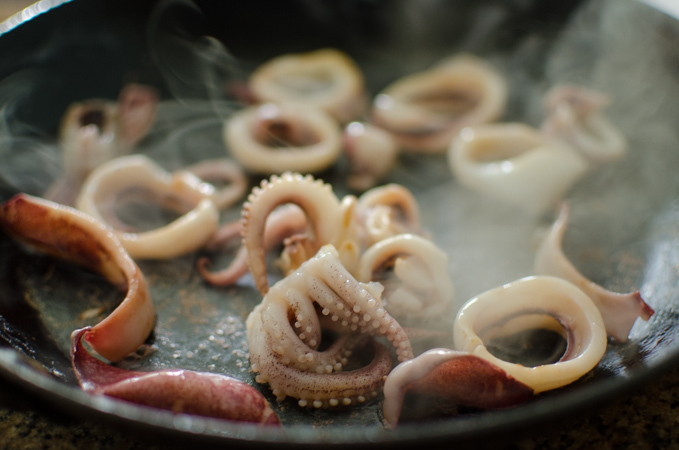 You don’t want to overcook your squid. Remove them from a skillet. Add the onion and carrot slices and quickly saute until crisp soft. Remove them from a skillet as well. Now, heat a dry skillet over medium-high heat. Sprinkle 1 tablespoon of sugar to caramelize. 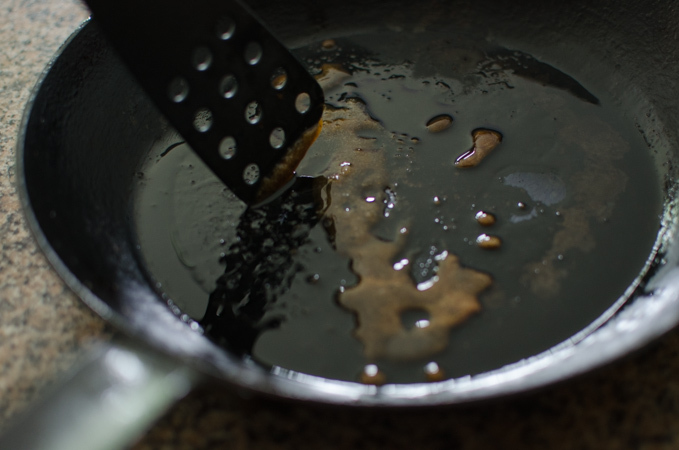 When the sugar turns golden brown, drizzle 1 tablespoon oil around. Add the pork, squid, the vegetables, and the sauce. Stir-fry quickly to incorporate with the sauce, about 1-2 minutes over med-high heat. That’s it. It is ready to eat. Serve with rice as we always do in Korea. Try with lettuce! 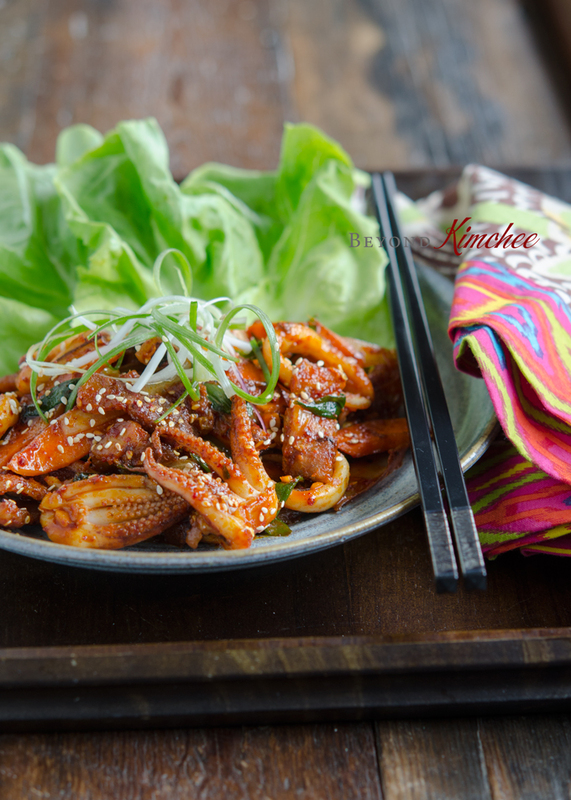 The spicy pork and tender squid over the rice wrapped in crisp lettuce… it is heavenly, folks! I feel like making another batch for my lunch again. Hope you enjoy! 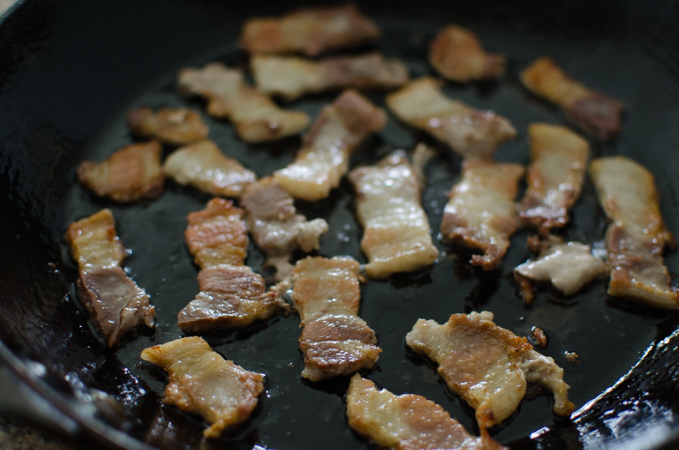 Cook pork belly slices in a skillet over med-high heat until somewhat crisp done. Remove from the skillet and set aside. 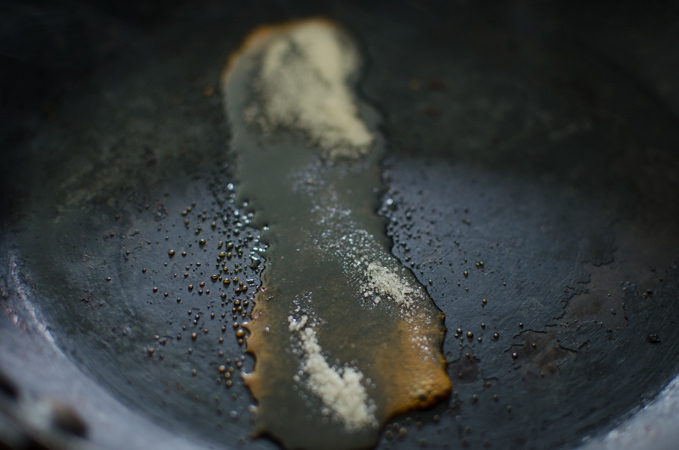 remove some pork fat in the skillet if there are too much. Add the squid and cook until they are curling up and become opaque, about 1-2 minutes. Remove from the skillet and set aside. 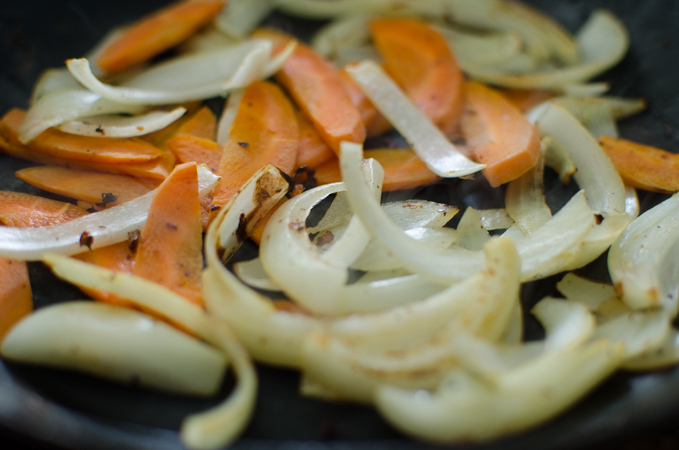 Saute onion and carrot slices until crisp tender. Remove from the skillet and set aside. Heat a dry skillet over med-high heat until hot. Sprinkle 1 tablespoon of sugar to caramelize. When the sugar turns deep golden brown, drizzle oil and return the pork, squid, the seasoning paste, and green onion. Cook everything over med-high heat until everything is incorporated with the sauce, about 1-2 minutes. Sprinkle more sesame seeds on top and serve immediately over rice. Wrap with lettuce if desired. It looks so tasty! I love these spicy pork and squid combo. Indeed it's a brilliant idea! Yes, you will need less time to bake. Thanks! What a brilliant combo of flavors! I've never had pork and squid -- really should give this a try. Thanks! Thanks, John! It is really flavorful and delicious to eat with rice. 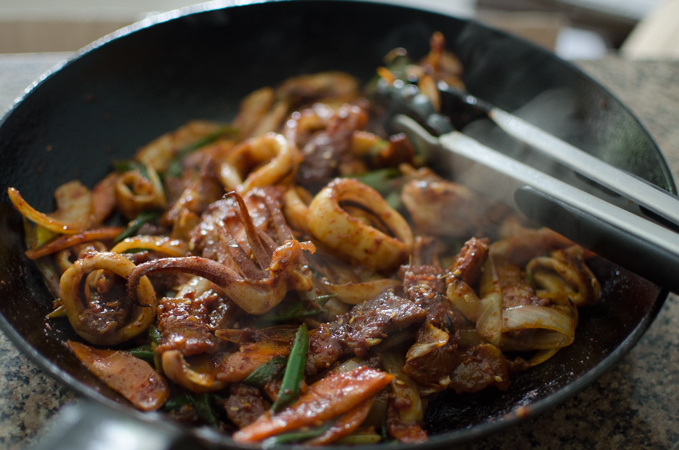 If you like Korean food and squid, you will like this. Love the combination of pork belly with with squid. Spicy squid is irresistible. And lovely photos as usual. This stir pork looks yummy and amazing! Is this real Korean style? It's awesome! Looks delicious! ! I would love to try this. May I ask what kind of curry powder is used or recommended? Hi Nini, Just use plain curry powder from the jar. Hope you like this. It is really tasty. Thanks! I came to say a huge thank you! You have made me discover the most extraordinary squid dish ever! I have fallen in love instantly and in spite of slight changes (like using smoked bacon I am addicted to instead of pork belly...), I never get tired to of this addictive dish. To tell you how I like it... I am the only squid fan at home, but I prepare it sometimes twice in a row only for myself ! Now whenever I buy squid, I ask myself "do I have smoked bacon in the fridge?" ;-) . 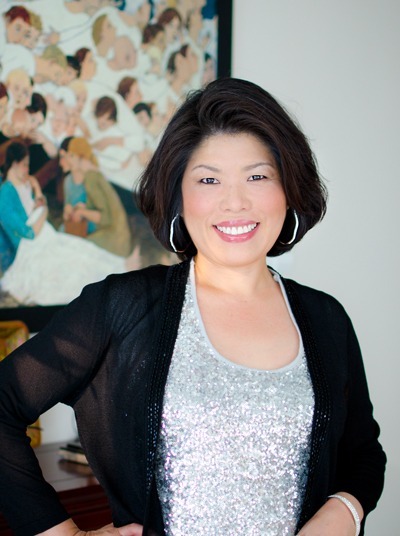 Thank you so much for sharing such a fantastic recipe. Without you I would have never dared combining pork with squid, but it's so magical! Hi Sissy, that is wonderful to hear that you like this recipe. Smoked bacon is a brilliant idea to use. I, too, wouldn't mind this tasty dish more than twice in a week. So good! Thank you so much for your approval. 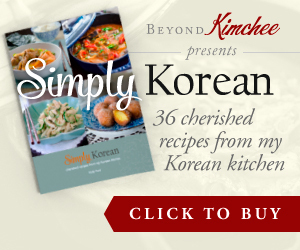 I've made today kimchi jigae with smoked bacon too... I am addicted to smoked pork ;-) (In the first comment I've forgotten to add I'd just posted my slightly changed version of your pork and squid dish on my humble blog; it doesn't look even half as good as yours but I had to share my new favourite squid treat with my readers). This was remarkably delicious. 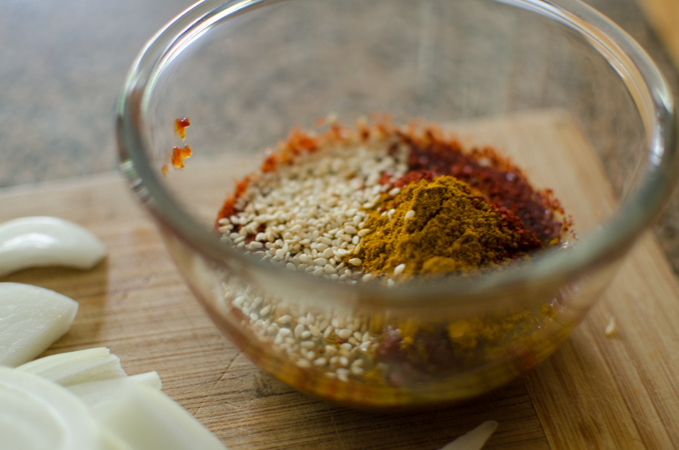 My husband and I both love curry, so we loved the curry powder in this recipe. Add some black or wild short grain rice to your regular rice cooking. The more you add in, the deeper purple color you will get. There is a German proverb which literally translates to "I could take a bath in this" which absolutely applies to this recipe :-) Thank you very much Holly.